FC Cincinnati stadium could transform the West End, but is it for the better? CINCINNATI -- FC Cincinnati isn't just trying to sell a $200 million stadium to the West End. The soccer club is also promising a transformation of the neglected neighborhood with new businesses, more jobs and additional affordable housing units. But some worry a new stadium could destroy the historic West End -- a place more than 6,000 people call home -- with increased traffic, soaring home prices and oversized parking garages. What happens when sports teams build stadiums in urban neighborhoods? It is a scenario that has unfolded in cities across the country with mixed results. Stadium experts insist the deals can benefit neighborhoods in the long run -- if they're done right. "It's not impossible," said Mark Rosentraub, a University of Michigan professor who's helped design dozens of stadiums across the country. "What does the community need? What does the team need? There's some great opportunity that creates benefits both for the community and the owners. It does happen." That's the conversation West End Community Council President Keith Blake wants to have with FC Cincinnati leaders. Blake has had to manage concerns in recent days from neighbors who have been suddenly thrust into a complex clash involving soccer, schoolchildren and politics. FC Cincinnati General Manger Jeff Berding on Monday revealed the club is interested in building its potential MLS stadium on Cincinnati Public School's Stargel Stadium site in the West End. In return, the team would build a new track and field complex on a vacant lot off of Ezzard Charles Drive. The lot was initially slated to become a new housing subdivision later this year. Blake believes a soccer stadium would bring opportunity to West End residents. He doesn't want anyone to get their hopes up. He doesn't know yet what FC Cincinnati could offer the neighborhood if the team is selected to join Major League Soccer and chooses to build its 20,000-seat stadium in the West End. But he has some ideas. A Laundromat and a health food store, new jobs, as well as modestly priced rentals or homes top the wish list. Many residents have to commute to other neighborhoods for work, he added. New jobs could change that. "The biggest potential for the stadium and businesses to come to life is the opportunity to have jobs within reach for residents," Blake said. While FC Cincinnati won't guarantee those types of perks will come with a stadium in the West End, the club will push for retail the community wants, former Cincinnati Mayor Mark Mallory said. Mallory, who lives in the West End, is doing outreach for the team's stadium planning. A stadium, he said, could bring more foot traffic to the area and encourage new stores to relocate. It could bring back the type of stores -- pharmacies, hair salons and chicken stops -- that lined the streets of the West End when he grew up there. "Some of that is way out of control of FC Cincinnati," Mallory said in an interview with WCPO Tuesday. "I do think there are things FC Cincinnati will do that make it more possible for a grocery store or a CVS (Pharmacy)." FC Cincinnati leaders hope their stadium will help attract new businesses to fill empty storefronts on Linn Street. The team has asked Gov. John Kasich to declare the area a special tax district, which would allow capital gains tax money to be placed in a special fund to be used for neighborhood improvements. Retail is key in stadium deals involving neighborhoods, Rosentraub said. For example, sometimes that means sweetening a development deal with a small grocery store, he said. "You want to make sure you're putting together the sort of retail that the neighborhood thinks is really valuable, but also the sort of retail that produces return for the owners," he said. "What you don't want to do is get a facility that is a flying saucer in an ocean." FC Cincinnati will have a say over how some development surrounding the stadium unfolds. The club last month purchased exclusive buying rights from Cincinnati Metropolitan Housing Authority for 66 vacant lots, which border existing apartments and condos in the West End. The team plans to hold those lots for a developer to build new housing. It remains unclear how much those new houses might cost. "Is it all affordable? Is it a mix? What is it? We've got to hear from the community," Mallory said. Those are the type of details Cincinnati City Council will want in writing. Council last year committed $37 million in tax dollars to build an FC Cincinnati stadium project in Oakley. If the project lands in the West End, the city will need to re-approve parts of the deal. To get those city dollars, council members say they want the club to commit to a community benefits agreement -- a neighborhood wish list of sorts. 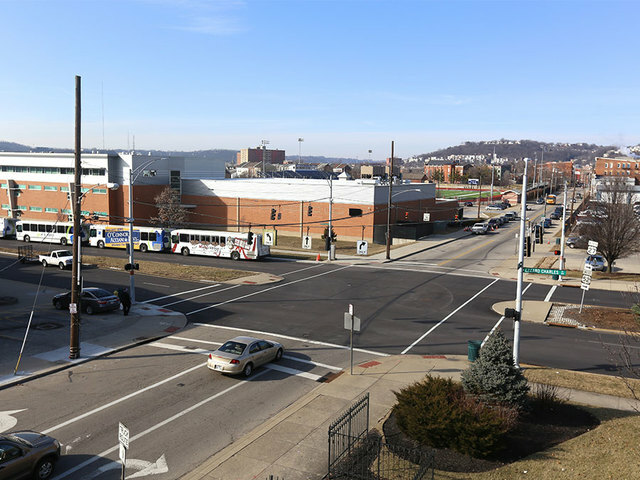 A view from the Town Center Garage of Cincinnati's West End, which could be home to FC Cincinnati's new soccer stadium. Photo by Emily Maxwell. Parking, minority hiring and affordable housing are likely to be the big items up for negotiation in that agreement. 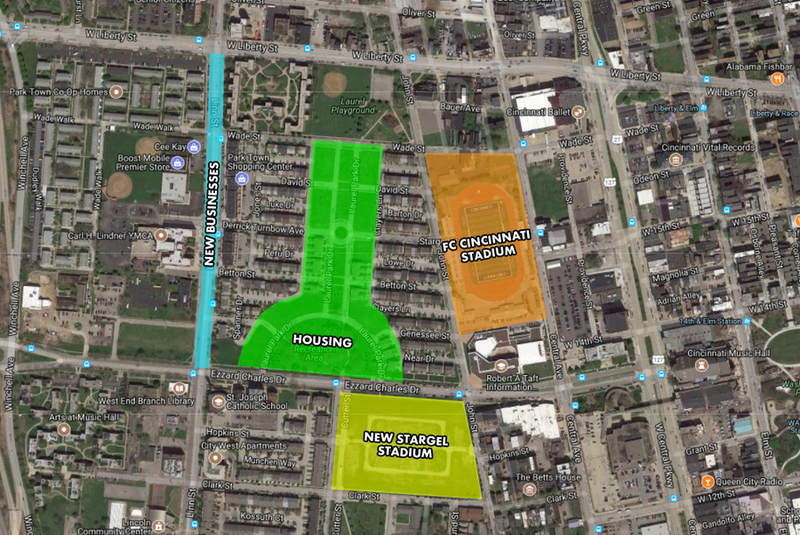 One of the big concerns: Will FC Cincinnati have to demolish houses to make way for a new parking garage or lot? "I don't expect that's going to be the case at all," said Mark McCullers, a Columbus-based sports consultant working with the team to develop its stadium plan. McCullers said the nearby streetcar and bus route will make public transportation to the stadium easy. There's also talk of rebuilding the Town Center Garage on Central Parkway to help support game-day crowds. A traffic study of the site began last week. Blake said displacement is the top concern he's heard from residents worried about the potential stadium. Ensuring skyrocketing home prices don't push people out of their homes and creating more affordable housing in the neighborhood will be major sticking points in that agreement, Councilwoman Tamaya Dennard said. "What drives me the most is displacement, and making sure that doesn't happen," Dennard said. "There has to be some guarantee that people who already live there right now can stay there. That's my top priority." Council is studying up on community benefits agreements across the country. Neighborhood groups in Los Angeles and Pittsburgh have worked with sports teams to hammer out similar deals for stadiums and arenas in their cities. Council already passed a motion last week calling for FC Cincinnati to sign a community benefits agreement. Dennard did not support that motion because she said it lacked details. The team is up for negotiating the type of housing built on the empty CMHA lots in the community benefits agreement, Mallory confirmed Tuesday. Still, others are convinced the stadium is bound to price some residents out of their current homes. The West End is a majority black neighborhood that has suffered when new developments -- such as when Interstate 75 was constructed in the late 1950s -- have devoured portions of the neighborhood. "They will have nothing to do with relocating people and displacing people," Cincinnati City Councilman Wendell Young told a crowd of nearly 300 people Monday night during a school board hearing on the stadium plan. "The reality is simply this: you have a historical neighborhood full of people who basically will have no other place to go, if they are displaced." Orlando City Soccer Club's owners faced similar skepticism from neighbors when they opened its new MLS stadium last year in the historically black neighborhood of Parramore, home to roughly 6,000 people. The team, which privately funded its entire stadium project, held town halls in the neighborhood and worked with the city on stadium plans, team founder Kay Rawlins said. The 25,000-seat stadium was built on the site of a defunct city police station, and no houses or businesses were demolished in the construction. "For us, any promises that we made, we were absolutely determined to keep them," Rawlins said. The team didn't enter into a community benefits agreement with the city because the stadium project didn't involve public funding. But since the stadium opened last March, the team has opened three mini soccer fields for kids in the neighborhood, built a community garden that serves 20 families and launched a weekly farmer's market that accept food stamps. The team also requires stadium vendors to take on apprentices in the neighborhood, she said. Eddie James is one of the Orlando business owners who was unsure how a stadium would impact traffic at his restaurant, Chef Eddies. He was afraid the food trucks that park outside of the stadium on game days would eat into his business. Or, loyal locals would have a hard time getting to his restaurant because of fan traffic. "The foot traffic is amazing," said James, whose restaurant sits across the street from the stadium. He's also a fan of the new roads, signs and lighting that went up when the new stadium came in. Other than that, he said, not much has changed in his Orlando neighborhood. "It's been a very positive thing for the neighborhood," he added.